Topshop recently challenged me to put together a summer/festival inspired look so, since the weather's been veering towards the Autumnal recently, I decided to go down the festival route. Well, day one of the festival when you're feeling fresh and actually put some effort into the way you dress in case you bump into Paolo Nutini in the crowd (you want to look your best when he proposes, obviously). Topshop's been one of my favourite shops since I was about fourteen and discovered that there was life outside of Primark, and I know I can always go in there and find something I like, so I was excited to get cracking. The past two festivals I've been to I've opted for chunky boots and just kept my wellies in the tent as a back-up - thankfully I didn't need them either time - because I find them a bit comfier to wander around in. The particular ones I'm wearing are now sold out unfortunately, but I've tracked down some similar pairs here, here and here. I always tend to team my boots with black skinnies, but this time I upgraded a bit with this pair here that have the most amazing zip detail and, added bonus, are also extremely soft and stretchy; forget the usual constraints of skinny jeans, you can jump around and crowd-surf to your hearts content in these. No festival look would be complete without a bit of fringing, which is where this striped top of my dreams comes in, as well as a good pair of sunglasses. I finished off the look with this incredible necklace, which looks like it's straight out of a Bollywood film. It's a lot more versatile than you would think and looks especially good paired with plain tees, the perfect all-rounder. Add a leather jacket to this skinny jean look - a la Alex Turner - and you're ready to go. Post put together in collaboration with Topshop; all words, views, and Paolo Nutini daydreams are my own. 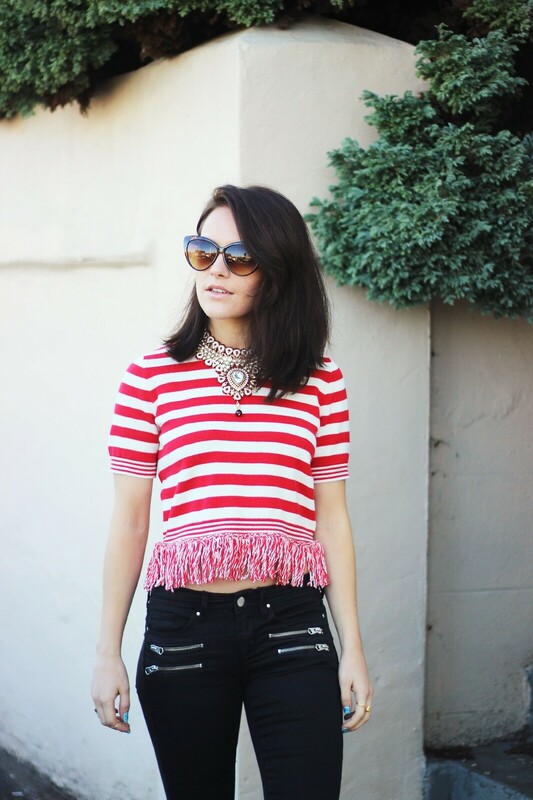 the necklace and the fringing on the crop top is perfect! And nobody even mentions waldo? Such a cute look! Loving that top and your necklace! So fun! love this outfit, the top is awesome. Awesome outfit, you're definitely ready for Paolo! Necklace and boots are super cool! GAHH THOSE BOOTS, THAT NECKLACE AND THAT TOP. It is all so amazing you look amazeballs! 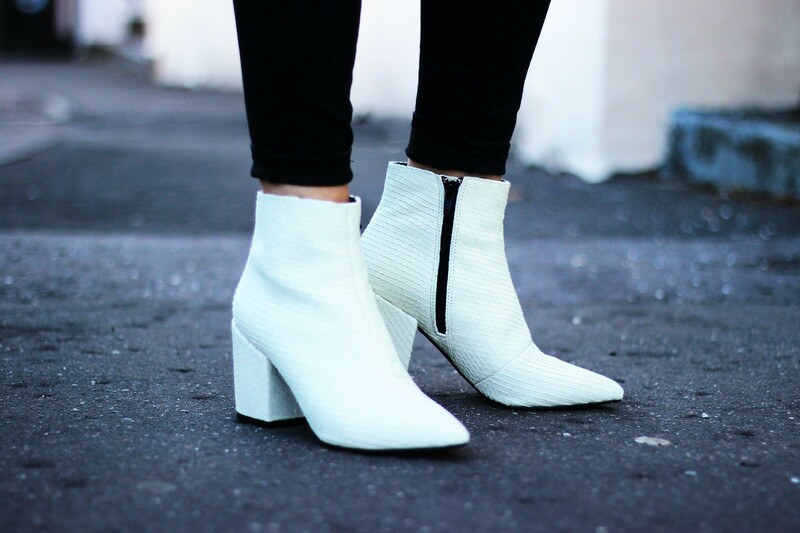 Okay, I need those boots in my life. They are heaven. I love the boots! Lovely post. So gutted I didn't pick up the boots when they were in the sale! Love that the red gives such a great pop of colour, and i love this festival look, its very put together but at the same time has that gorgeous festival vibe! You always hit the nail on the head with your outfit posts! Perfect look, I am loving the shoes!! On paper this look really shouldn't work, but I love it. The boots just look amazing! Omgosh, I want those trousers! So typical that they've sold out! That necklace is something else! Wicked outfit! I find posts like this really helpful, where you can see lots of pieces from one retailer put together in an outfit. Thanks! I've started a regular 'Tuesday Top Picks' post on my blog, and this Tuesday is Topshop. Would love you to have a look.